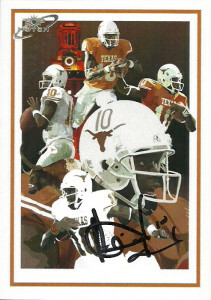 Cards: UT UD 2011 NCAA, UT UD 2011 Icons, Donruss Threads 2009, TNT College, Leaf Rookies & Stars 2007, Playoff Contenders 2007. VY was in relatively good spirits for the first event- a grand opening for Tiff’s Treats in the east part of town. While the weather had been pretty bad all weekend, the worst of it had passed allowing me to go into town for the event. I thought that by getting there roughly 30 minutes early I’d be good for a few autographs as the rain would keep away some of the fans, but I was completely wrong. there I’d say for the soft opening of the store so I just got into line and prepared for one autograph. To hedge my bets I traded a card to a kid behind me in exchange for his father getting an autograph on a card for me- so I’d at least walk away with two. On top of it, only one of the cards I had gotten off of EBay showed up before the event. Nothing really worked out the way I expected for this event, but in the end, it really did. 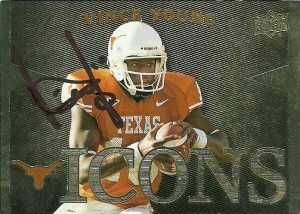 The rain wasn’t all that bad, and VY was in such good spirits he offered to sign 1,2,5 cards if I wanted to, so I was able to get two, plus the one that I had gotten as insurance through the trade earlier. Initially I didn’t really like the Donruss Threads card I got through EBay, but it grew on me a lot, especially with the football cut in there. Otherwise I probably wouldn’t have paid this card any mind. 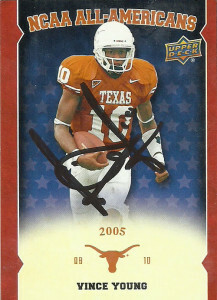 word of MVP Vodka, who was slowly making the rounds about Texas having bottle signings. 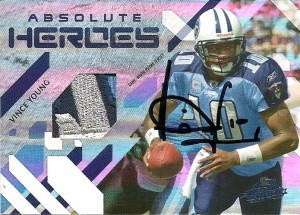 This would finally allow me to get the really nice Absolute Memorabilia card signed I picked up through EBay. The signing went well enough. As usual Vince showed up a bit late, but there was almost zero people waiting, despite the radio advertisement. 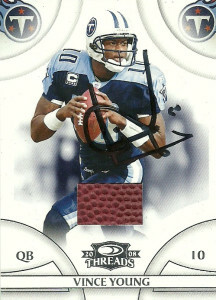 He was nice enough to sign the Absolute card and the Top Notch custom I did of him. I asked him if he’d forgive my awkwardness from the poster debacle at the Sam’s Club event, but he told me that he didn’t remember it. I guess that’s good. Ah well, I mean at least he signed another piece of my art- no matter how underwhelming the response was. Deadhorse. It took about 5 months for Young to pop up for another Tiff’s Treats grand opening. As usual Vince was fashionably late to the event. The problem was it was a group event with Kasey Studdard, Justin Blaylock, and Quan Cosby. 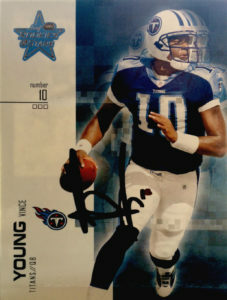 Thankfully with a bit of fast thinking, the promoters had fans line up behind VY’s chair so that when he did show up, everybody got a chance to get his autograph, and he was happy to sign multiples. He had his son there with him, and after he signed each card, his son would inspect them to make sure that they were up to snuff. It was very cute. 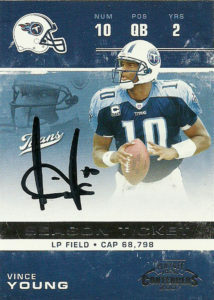 I told VY about how painful it was to watch him on the Titans, especially when he played the Texans, because he always made us pay. I was surprised that he responded by telling me that he hated it too. Vince played it low key for the past few years here in Austin, but in early 2017 made waves as he agreed to a free agent contract with the Saskatchewan Roughriders of the CFL. Saying the desire and want is still there, Young seemed primed to make an unlikely comeback.